In many companies, especially the large ones, we fail to talk to each other enough to know what needs to change to drive continual improvements and reduce waste. This work will guide any size plant or organization to improve how they do maintenance, how to keep their equipment running longer, and create a more efficient and streamlined structure so they can be competitive in today’s market. 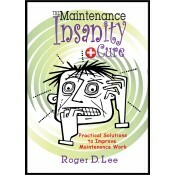 The practical solutions offered in this work present the perfect antidote for maintenance insanity. The book is chock-full of useful checklists, flowcharts, templates and other helpful documents that readers can customize for their own needs.